Race Fans that braved the unseasonably cold temperatures were treated to a night of hot on track action that in some cases led to overheated tempers. Third generation driver Erick Rudolph and Kevin Knapp scored their first 2013 wins in Lococo’s Wholesale Night at Merrittville Saturday May 11th in the Bobcat of Hamilton 358 Modified and Hoosier Stock Divisions respectively. 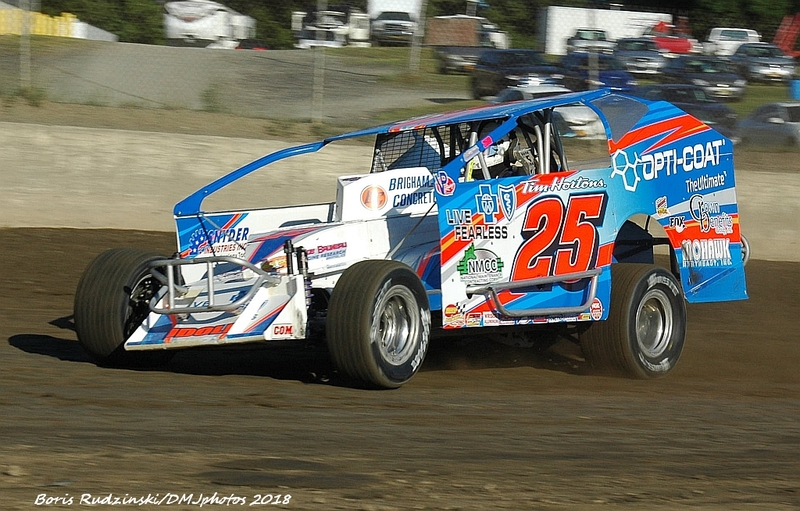 Lucas Oil Weekly Racing Series action also saw three drivers make their second straight visits to Victory Lane – Kyle Pelrine, Josh Sliter and Brad Rouse in the Turn 4 Collision 4 Cylinder, J&S Heating and Air Conditioning Modified Lites and the Rick’s Delivery Sportsman Features. It has probably been close to 25 years since a Rudolph has been in Victory Lane at the Thorold facility and Erick’s dad – former racer Charlie was one of the first to congratulate him. Around the halfway point and beyond of the 35 lap event, Rudolph and then leader Mike Bowman staged quite a battle for the lead with Chris Steele also in the fray. The first serious challenge by Rudolph came on lap 20 after pulling alongside Bowman with Steele challenged by Scott Wood. With Bowman running high and Rudolph low – both drivers were looking for the advantage – one that Rudolph found on lap 23 after taking the lead. Caution on lap 25 would slow the pace. Again the two front-runners were side by side until Bowman regained top spot only to be slowed once again. Rudolph was able to power back past Bowman for good with Pete Bicknell taking control of second on lap 28. The 22 time points champion still looking for his first win of the season could not catch Rudolph by the Checkered Flag however. ATLANTIC CITY, NJ (January 21, 2013) – Though the majority of pre-race attention for the NAPA Auto Parts Atlantic City Indoor Racing Weekend has centered around the drivers who will compete, the fans who attend the February 1-2 races in Boardwalk Hall are in for their share of the spoils. The 11th running of the marquee event under the direction of Len Sammons Motorsports Productions, is planned for Friday and Saturday nights Feb. 1-2, 2013. The events will be the third and fourth events of the Fatheadz Eyewear Indoor Series. On Saturday night, from 5pm to 6pm, fans holding lower level reserved seats will be invited to the racing surface to meet and greet the drivers. There, drivers will sign autographs, hand out treats and souvenirs to their fans and, in one case, offer interested youngsters the chance to win a valuable prize. Brett Michalski, a 600cc Micro Sprint driver from Penndel, Pa., and his team will offer free I-Pods to one lucky girl and one lucky boy from among those who participate in a free drawing. The winners will be named at the conclusion of the pre-race Fan Fest. Ted Christopher of Plainville, Ct., and Mike Lichty of Innerkip, Ontario, won the two previous Three Quarter (TQ) Midget Indoor races this season, run in December at Providence, R.I., and Baltimore, Md., respectively. Christopher leads Anthony Sesely, who had top four finishes in the two prior races, in the Fatheadz Indoor Racing Series standings. Two TQ drivers have attracted considerable attention. Billy Pauch, who has won nearly 700 races in his career but never the ‘Gamblers Classic’ inside Boardwalk Hall, returns to a car with which he won a preliminary race in 2009. And Jimmy Blewett, a 100-time career winner on Modified asphalt tracks, will be making his first career start in a TQ Midget. Champ Karts, 600 Micros and Herr’s Snack Food Slingshots are the three support classes that will join the TQs indoors. DJ Shaw and Cody Sieber won the pair of Champ Kart races at Baltimore and Providence but Brandon Rusczek of Wallingford, Ct., is the Fatheadz Indoor Race Series points leader after two events Rusczek, Shaw and Sieber are among over fifty Kart racers who will qualify on Friday, then race on Saturday night in their feature race. While the TQ Midgets and Sr. Champ Karts already have two indoor races under their belts this winter, the 600cc Micro Sprints and Slingshots will be racing for the first time during this indoor racing season. Both types of car have been on the Atlantic City Indoor race schedule in the past and their entry list has been full for over a month. Overall, more than 200 teams are expected to be vying for starting berths in the four feature races. Last year’s winners indoors in Atlantic City were Erick Rudolph, who won the Gamblers Classic TQ race and both 600cc Micro main events, Christopher, winner of the remaining TQ race, Simon Egan, winner of the Slingshot race and Chris Daley, victor in the Champ Kart main event. All 2012 winners are among the entries for the 2013 NAPA Auto Parts Racing Weekend. Tickets for the Atlantic City events are on sale at Ticketmaster outlets, online at www.ticketmaster.com and at the Boardwalk Hall box office. A limited number of the prized lower level seats remain for Saturday night’s event, however there will plenty of general admission seating available the day of the event. Further information can also be obtained by calling the Len Sammons Motorsports Productions administrative offices (9 a.m. to 5 p.m.) at 609-888-3618 or online at www.aarn.com.